Hospital at Home: Patient Care Model of the Future? Hospital at Home, a pioneering healthcare model, allows for acute hospital-level care to be provided to elders in the comfort of their homes. “Hospital at Home has been well studied. A new meta-analysis in the Medical Journal of Australia found a 24% reduction in readmissions for Hospital at Home and about a 20% reduction in mortality, which is really quite remarkable,” says Bruce Leff, MD, who developed the Hospital at Home model and is a geriatrician and professor of medicine at Johns Hopkins University in Baltimore. In fact, the number needed to treat (the number of people who need to receive a treatment to prevent one death) patients at home compared with the hospital is 50. This is remarkably low compared with other well-regarded treatments. For instance, 2,000 people need to take an aspirin daily for one year to prevent one nonfatal heart attack, he says. Stephen C. Acosta, MD, medical director of Program at Home at the Portland VA Medical Center in Oregon, says patients with COPD, community-acquired pneumonia, CHF, and cellulitis can be cared for in the home with appropriate screening from referral sources and can avoid hospital complications. This is important because the literature suggests that hospitalizing older adult patients rather than utilizing home care produces a higher incidence of urinary tract infections, hospital-acquired infections, and delirium. 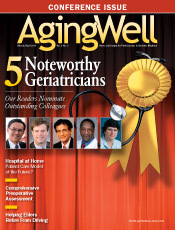 The criteria for choosing the right Hospital at Home patients started with a framework that hospitalized older people with many chronic conditions or comorbidities who are at greater risk for iatrogenic complications, functional decline, adverse drug reactions, delirium, and falls, Leff explains. “We did not want to exclude people from Hospital at Home because they had other chronic conditions. We think people with multiple chronic conditions are probably in many ways candidates for Hospital at Home because they tend to be most susceptible to problems that can develop from just being in the hospital,” he says. Other factors enter into patients’ consideration for treatment in their homes. “In addition to the medical criteria, there are certain other criteria, more social criteria in terms of the suitability of the home environment for Hospital at Home. So patients need to have a house or dwelling with a roof, climate control, and running water,” he says. McClelland says the Hospital at Home model provides physicians, caregivers, and other healthcare professionals with an option to enjoy working in an environment different from a hospital. “Imagine a primary care setting where physicians are able to spend half of their time seeing patients in the office and then the other half of the time seeing hospitalized patients in their homes. Many nurses would also be very attracted to this acute level of care, which up to now is only in the hospital.” He notes that while for more than 70 years hospitals have been the epicenter of the healthcare industry, Hospital at Home will help to reshape this concept as it augments primary care. “Physicians should understand that adopting Hospital at Home is like building a new kind of system for their hospital. What we have found is that adoption of the model is driven by local hospital, health system, and payer considerations,” Leff says. Acosta notes that Hospital at Home is not geared toward volume. “It would be geared best for people who use the system immensely, and that goes both for the VA and Medicare. Older adult patients will benefit from the Hospital at Home model as opposed to people who require general healthcare,” he says. McClelland notes that physicians need to initiate dialogue if they are interested in learning more about instituting Hospital at Home. “Physicians need to begin to talk and to establish a dialogue with their home-care community and to find out what the capacity is in their home-care community. Home healthcare organizations have very strong relationships with their hospital partners, so establishing Hospital at Home is going to be a partnership between a hospital and a home-care agency. Because Hospital at Home will be driven from the home-care world, I would encourage physicians to reach out to home-care providers to find out what they’re doing,” he says. “My connection with Hospital at Home began when the Centers for Medicare & Medicaid Services [CMS] released the healthcare innovation challenge. They were giving huge amounts of money for the development of innovative care delivery models. I felt that Hospital at Home fit that bill nicely,” McClelland explains. “So working with Presbyterian Healthcare Services in Albuquerque, New Mexico, I put in a $19 million grant application to CMS. What we were going to do was expand the Hospital at Home program to five different locations across the United States. Through a series of solicitations, we recruited five partners across the United States who were committed to implementing this model. Unfortunately, that’s where the story ends because CMS did not fund my grant application. “Hospital at Home is, in my opinion, a model that is waiting to happen, and it will happen. It has been used internationally throughout Europe for 10 years now, and there have been different variations. It hasn’t taken off in the United States primarily because the third-party payers don’t recognize it because they don’t have payment codes,” McClelland adds. The economic implications of implementing the program offer compelling results. “The concept of avoided hospital admissions really works economically in a socialized system like the VA and Kaiser [Permanente], where saving cost in terms of hospitalizations makes fiscal sense for the organizations, unlike private hospitals that depend on admission, health insurance, and Medicare money,” Acosta says. He explains that McKesson, a healthcare services and IT company, has a proprietary set of admission and hospitalization criteria called InterQual. “InterQual criteria are used by probably 85% of the country’s hospitals, but the criteria do not determine the actual payment. Nonprofit hospitals also use InterQual, but all hospitals that are not part of a socialized system like HMOs or the VA make decisions based on a fee-for-service model,” he says. Right now there’s no mechanism to pay for Hospital at Home in a fee-for-service environment, Leff says. “Medicare will pay for a hospital stay, an office visit, a physician house call, and for home healthcare, but there’s no payment code in Medicare for Hospital at Home. If you live in a fee-for-service world, this is a very difficult model to underwrite. If you’re in an integrated delivery system or managed care environment, then the model makes a lot more sense,” he says. “For instance, we’ve had a number of adoptions of the model in the VA healthcare system. The VA is basically a managed care system where medical centers get global budgets, and then they have to figure out how to spend that money. Every dollar that they save falls straight to their bottom line. It’s also a really nice fit for integrated delivery systems,” Leff adds. “Presbyterian Healthcare Services, which adopted the model, has Medicare Advantage, a Medicare managed care product. They have their own health plans for people they insure. Since they are in a situation where the hospital is running a little bit above capacity, they are able to provide Hospital at Home for their health plan patients,” Leff explains. “They were able to save money on those people who would’ve gone to the hospital who now go to Hospital at Home. They found that they had a 19% savings. Those patients who would’ve gone to the hospital but did not left beds open for Presbyterian to take care of other patients who might’ve been fee-for-service patients. Ready for Hospital at Home? Organizations seeking to adopt innovative care models often need to develop new systems and roles while overcoming resistance to change. To successfully implement Hospital at Home (www.hospitalathome.org), you need to ensure that the conditions at your facility are right and that needed resources are readily available. Is your health system experiencing problems from a lack of hospital capacity? Does your health system have established home health care delivery capabilities? Do you have physicians with the interest and ability to care for patients in the home environment? Does your health system experience a large volume of Medicare admissions for common problems such as community-acquired pneumonia, heart failure, or chronic obstructive pulmonary disease? Does your institution view itself as an innovator in developing and implementing new models or systems of care? If you answered yes to one or more of these questions, then Hospital at Home may be appropriate for your organization. Herritt B. History of the house call. Univ Toronto Med J. 2012;89(3):175-177. Leff B, Burton L, Mader SL, et al. Comparison of functional outcomes associated with hospital at home care and traditional acute hospital care. J Am Geriatr Soc. 2009;57(2):273-278. Frick KD, Burton LC, Clark R, et al. Substitutive Hospital at Home for older persons: effects on costs. Am J Manag Care. 2009;15(1):49-56. Caplan GA, Sulaiman NS, Mangin DA, Ricauda NA, Wilson AD, Barclay L. A meta-analysis of “hospital in the home.” Med J Australia. 2012;197(9):512-519.